Home > Toys and Collectibles > Toy trains, tracks, etc. AHM HO Duplex Sleeper car, Baltimore & Ohio. 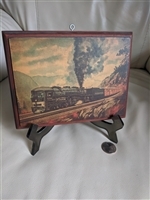 Vintage Southern Pacific official plaque with cab-forward train. 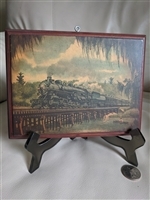 Vintage Southern Pacific official plaque with Sunset Limited P 9 locomotive. Vintage Gold tone metal Locomotive on marble base bookend, paperweight, door stop. AHM HO scale diesel locomotive train in box. AHM HO scale SEABOARD Spirit diesel locomotive. Rivarossi, Bachmann, Tyco Locomotives and railroad carts set, 13 pieces.